Toronto/Three Fires Territory has long been a place that people move to in order to join queer and trans Black, Indigenous and people of colour (QTBIPOC) communities. Yet the city’s rich history of antiracist and anti-colonial queer and trans activism remains largely unwritten and unarchived. While QTBIPOC have a long and visible presence in the city, they always appear as newcomers in queer urban maps and archives in which white queers appear as the only historical subjects imaginable. To unmap and counter-archive this, this team of five FES and York faculty, grad students and graduates, including Professor Jin Haritaworn, Syrus Marcus Ware, Ghaida Moussa, Alvis Choi and Rio Rodriguez, has brought together some of the city’s finest artists, activists and academics in these two books. Educators interested in teaching the books can order free exam copies here (for Queering Urban Justice) and here: publicity@btlbooks.com (for Marvellous Grounds). 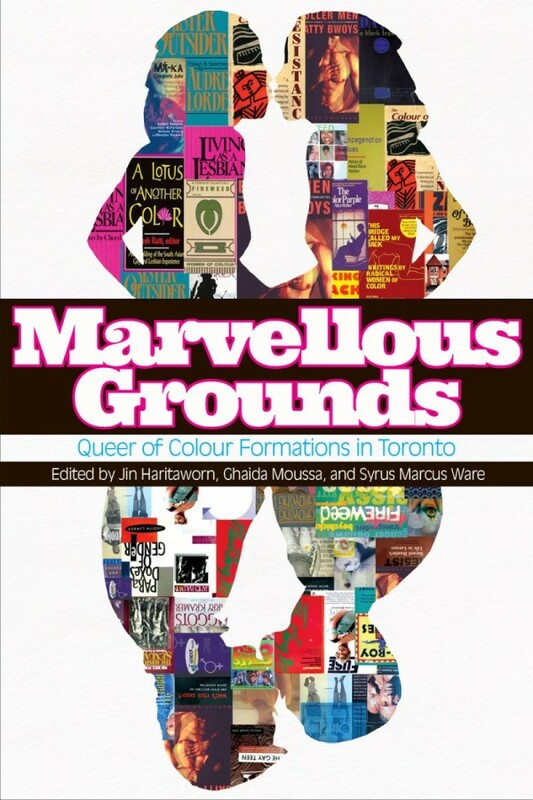 Featuring the art, activism, and writings of QTBIPOC in Toronto, Marvellous Grounds (Between The Lines) tells the stories that have shaped Toronto’s landscape but are frequently forgotten or erased. Responding to an unmistakable desire in QTBIPOC communities for history and lineage, this rich volume allows us to imagine new ancestors and new futures. 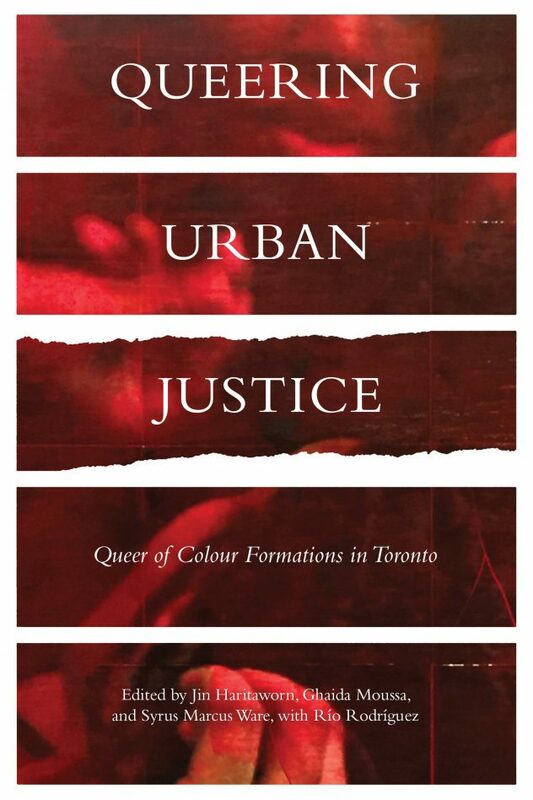 Queering Urban Justice (University of Toronto Press) foregrounds visions of urban justice that are critical of racial and colonial capitalism, and asks: What would it mean to map space in ways that address very real histories of displacement and erasure? What would it mean to regard QTBIPOC as geographic subjects who model different ways of inhabiting and sharing space? Contributors: Nayrouz Abu Hatoum, nisha ahuja, Asam Ahmad, Tara Atluri, Beverly Bain, Carol Camper, John Paul Catungal, Tings Chak, Matthew Chin, Kusha Dadui, Robert Diaz, OmiSoore Dryden, Nwadiogo Ejiogu, Amalia M. Duncan-Raphael, Audrey Dwyer, Dionne Falconer, Che Gossett, Junior Harrison, Jin Haritaworn, Monica Forrester, Richard Fung, Chanelle Gallant, Lamia Gibson, Pauline Sok Yin Hwang, Lezlie Lee Kam, Janaya Khan, Elene Lam, Marissa Largo, Davis Lewis-Peart, Alan Li, Azar Masoumi, Courtnay McFarlane, Ghaida Moussa, LeRoi Newbold, Leah Lakshmi Piepzna-Samarasinha, Philip Pike, Fritz Luther Pino, Aemilius Ramirez, Nadijah Robinson, Rio Rodriguez, Zahra Siddiqui, Danielle Smith, Rebeka Tabobondung, Shaunga Tagore, Carol Thames, Laureen Blu Waters, Syrus Marcus Ware, Melisse Watson, Alexandria Williams, Natalie Wood, Kate Zen. —Onur Suzan Nobrega, Institute of Sociology, Goethe University, Frankfurt, Germany.